Oh boy did we ever get stuck on this one. 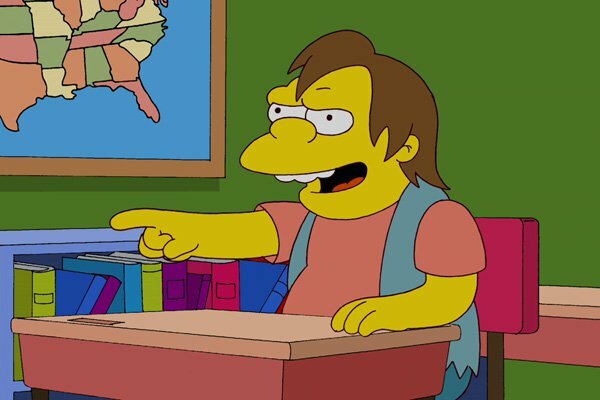 We’re passing the buck to you, which Simpsons villain has the best evil laugh? 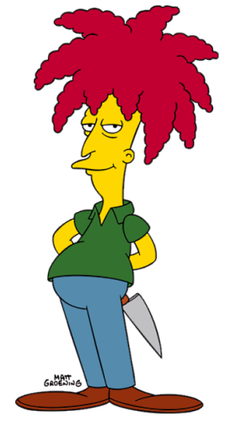 Robert Terwilliger, the esteemed academic and second fiddle to a kids’ show host has been hard done by and done down by a clown. Foiled in his criminal escapades time and time again by Bart, the two have proven dread nemeses to one another, requiring Bob to come up with increasingly devious plots, accompanied time and time again, accompanied by Kelsey Grammar’s booming theatrical cackle. The capitalist megalomaniac is out of touch with every generation still living, it leaves one with a certain detachment that makes it easier to dump nuclear waste wherever you please, sweep humanitarian issues under the expensive rug, skin puppies, and yes, take candy from a baby. His cackle has a Dracula-esque quality that matches his age, with hints of mad scientist. The quintessential school bully may lack severely in brain power, but he has gloating down to an artform, The signature “Ha-ha” is so iconic that I’m fairly sure you read it in his voice. It’s cold, exploitative, and he’s always nearby to deliver at your lowest moment, at times even laughing at you from incredible distances, as though he senses your misfortune and lives to exploit it. We could have found plenty of video game entries for this list, but actually when we stepped back, most of the iconic laughs came from film and TV series. 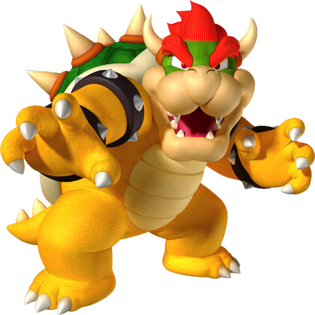 But there is one constant who we knew would make an entry here; someone who might not always be strictly evil, but is at least 90% of the time considered to be the primary antagonist of the series – Yes, we’re talking about Bowser from the Mario franchise. Bowser isn’t always bad, but when he does laugh he has that signature “bwahaha” style laugh which you can’t help but chuckle with. It’s super deep, sounding more like a guttural belly roll more than a laugh, but that’s what makes it such a notable sound. Whilst it’s fair to say that there are indeed other great laughs in video games, very few can say they’re as iconic, or memorable, as this one. One of the older sounding laughs on this list, Emperor Palpatine is one of those characters who easily gives you the creeps. A slimy sounding laugh, Palpatine is a character we’ve all come to fear – and yet, at the same time, respect in an odd way. You can’t deny that when you are faced against someone as powerful as Palpatine, you know you’re in for a bad ride when he laughs like that. All in all, Palpatines laugh is one of those that commands respect – At least from his evil minions. He’s the embodiment of evil, willing to kill of Jedi left right and centre, so he can fulfill his evil fantasies. He seems like the type of character who would purposefully bring someone back from the dead, just to mock them and kill them again. Fear this one, for he’s the all mighty emperor. No other villain could master that high pitched cackle. Alan Oppenheimer gave us the kind of chilling laughter that could only come from the skull faced master of Castle Grayskull, and though the demon lord is otherwise as muscular and barrel-chested as his equally masculine counterpart, He-Man, somehow a deep booming belly-laugh simply wouldn’t fit the lipless smile. Though sadly burdened with the greatest threat to all villains – the incompetence of his minions – his goal to conquer Eternia before moving on to the universe remain broadly untarnished. Though he faces a powerful obstacle, he has no shortage of plots, schemes, and powers, not least of which the classic mirror-escape which we love, he’s pure villainy with a laugh to go with it. 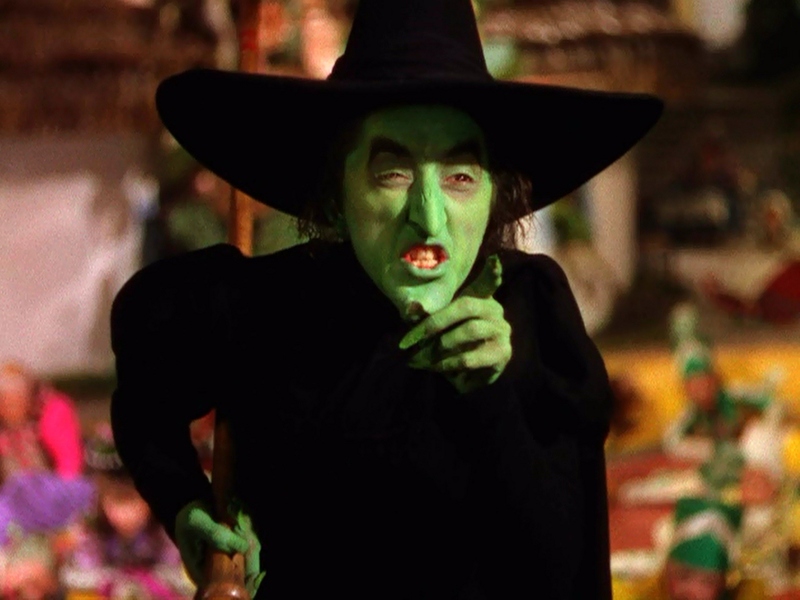 The classic, the Wicked Witch of the West is one of the most iconic laughs in all of film history. The film was released back in 1939 to a roaring success, as well as being the first film to genuinely use technicolour which was a marvel back in the day. Even in this day and age, the film has aged gracefully and is a joy to watch. Part of the joy of watching the film is the sheer that you feel from the laugh of the Wicked Witch of the West. The most charismatic man in horror history (sorry Bruce) renowned for his towering height, sleight features, and his voice capable of ranging from simpering henchman to sinister vampire, it was that laugh that became a staple of the genre for decades. Sampled on every cheesy Hallowe’en album and on Michael Jackson’s legendary Thriller video, it’s the very laugh of Dracula himself. 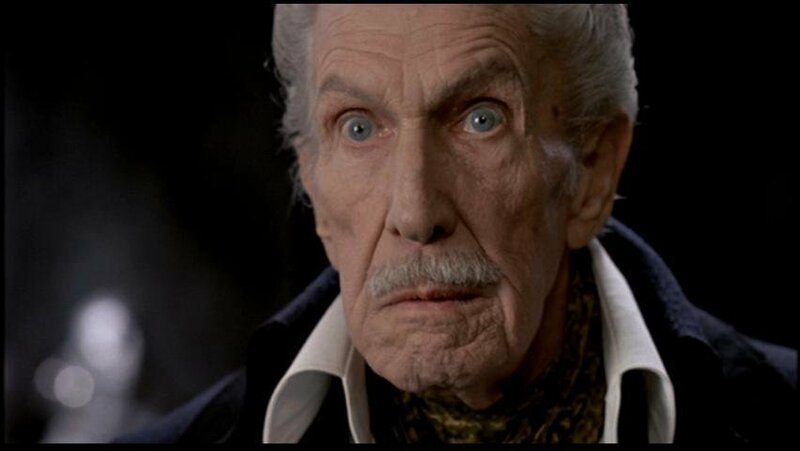 For many years until his death in 1993, he was the go-to narrator for spooky stories and expositional narration on monster flicks, and was the face of every Edgar Allan Poe adaption of the early sixties. His narration lent a chilling element to any scene, and to many an album, topped off with his signature echoing laughter. If she doesn’t scare you, no evil thing will – but even more, her laugh can easily make you feel like your whole life has been for nothing. Her laugh is one of nightmares; it’s nothing too insane, but it’s a highly exaggerated power-trip of a laugh. She’s got such an incredibly commanding voice, that her laugh carries through hallways and more. Cruella is genuinely the most evil lady in all of Disney. Cruella is one of those characters who should terrify you – The cartoon version of her may be one of the most possessed Disney characters out there. This is why, along with her incredible laugh, she deserved to get in this list. You know when you want to mock an evil laugh? You sort of make that “Moo wuh huh huh” sort of laugh, often written as the aforementioned “Muwahaha”. I think no one did this laugh justice more than Dr. Evil from Austin Powers fame. An evil super genius, who wanted to blow up the Earth or get one hundred billion dollars, or something like that. I mean, when you’ve got the resources like Dr. Evil does, that’s a pretty easy thing to achieve. Kind of. When you think of parodies of an evil genius though, Dr. Evil tops the list. Austin Powers may be a relatively niche type of film – a parody of the spy genre – but I think the fact it’s such an easy to understand parody makes it one of, if not the most recognisable of its kind. With three box office successes, there’s no doubt that this evil genius is going to be the one to get the last laugh. 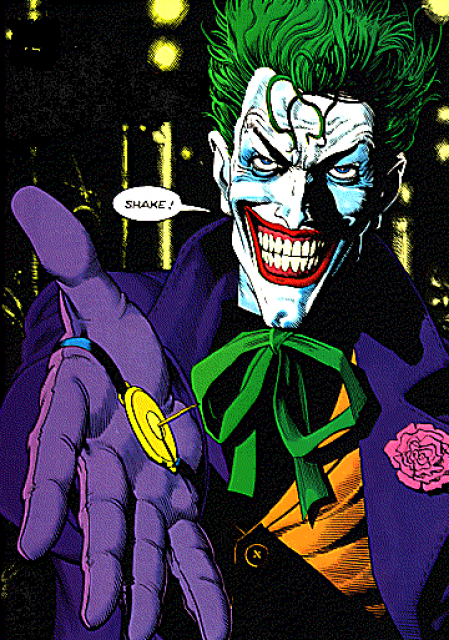 Another tricky one, because when you talk about the Joker, who are you talking about? Mark Hamill may be the most beloved Joker of all time, but every actor to don the greasepaint and automatic rifle has brought their own flare to the role. Heath Ledger gave us an anarchic, unreserved howling in keeping with his terroristic mobster; Jack Nicholson was every bit as sinister as we’d expect from… well Jack Nicholson. Cesar Romero may have been the original master of the Clown Prince, and he most certainly set a high bar, but there’s no denying he’s been bested and reimagined repeatedly over the decades. In any case, the laugh is a hallmark of the character, and a measure by which all Jokers are tested. Oh, and I guess Jared Leto did it too… actually his laugh wasn’t half bad. The only laugh that could possibly have topped any Joker (to be fair, Dr. Evil got close). Hugo Weaving played the cold and heartless machine designed to scrub rogue agents from the system designed to keep us in check, and he played it with solemnity and a vague hint of malice. An entity comprised entirely of code, suddenly set free of the confines of his programing, or even the bounds of the system, living the freedom he has kept from others. The maniacal glee when he laughs is pure hatred and joy, a cry of victory over the death of the Oracle, and it’s an expression of emotion a program should not be capable of. His ambition solidifies, and he becomes – truly – the one thing he’s hated since the first film: human. And how many .gifs can you hear while you watch? With that, our group of laughing villains and villainesses have been silenced. Honestly, I was getting a headache from all of the laughter they were throwing at us. Nevertheless, it’s time for two more whose laughs aren’t quite up to standard to get in the main list, for a variety of different reasons… but we had to mention them both! This entry makes me smile every time I think of it. So, when you think of someone as evil and as powerful as Lord Voldemort, you can’t help but think that when we hear him really enjoy himself, we’ll hear some sinister, sibilant laugh. Indeed, we expect the parseltongue from within him to really start to showcase itself, with hisses and perhaps even a cackle to boot from the laugh. But no. This is what we got. And it’s beautiful. 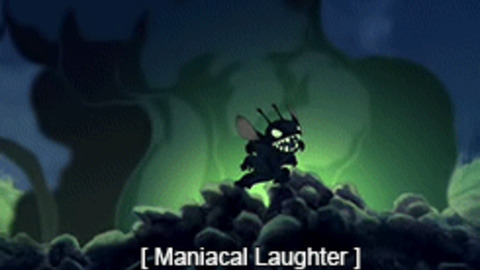 It’s absolutely the best laugh any evil character has ever done in their life. Watch it. Shove it on repeat. Enjoy this beautiful laugh in all of its magnificence. I need someone to be my friend… someone who won’t run away. Maybe send me an angel… the nicest angel you have. The manic gremlin from outer space, the living weapon, the agent of destruction… and “angel”? Yeah, we’d be laughing too. As an engine of absolute destruction, cast out from his home planet, Stitch was made evil, quite literally designed to wreak as much havoc as possible and have fun while doing it. His laughter is nothing if not evil. But… of course while his glee may still be sadistic, the love of an outcast little girl has tempered the evil streak, so that Stitch now harnesses his destructive power for the good of those he loves. The laugh may be evil, the laugher, not so much. Now that the cat’s out of the bag about these evil laughs, I think it’s fair to say they won’t be laughing at us any time soon. Indeed, I think we can safely say that we’ll be the ones laughing with these villainous characters. But, whilst we laugh to blend in with their evil plans, let’s focus on the future and choose which of the following choices will be our Top 10 for next week’s list. That’s it for another Top 10, we’ve been laughed out! We’ve had more laughs than Joker at a comedy club. But what did you make of our list? Did we include the right characters? Did we forget a character who deserved to make this list? Share your thoughts in the comments below, or reach out to us via Facebook or Twitter. 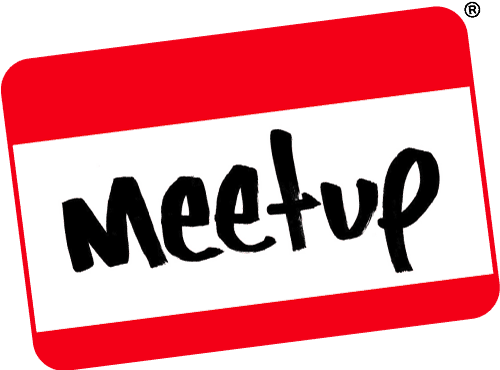 This entry was posted on January 26, 2019 by GeekOut Team. It was filed under Entertainment, Film, Gaming posts, Television, Top 10, Video Games and was tagged with Agent Smith, Austin Powers, Batman, Bowser, Cruella De Vil, Disney, Dr. Evil, Emperor Palpatine, Evil Laughs, Glenn Close, Harry Potter, Jack Nicholson, Joker, Lilo & Stitch, Maniacal Laughs, Mario, mark hamill, Mr. Burns, Nelson, Sideshow Bob, Skeletor, Star Wars, Stitch, The Matrix, The Simpsons, The Wicked Witch of the West, Thriller, Top 10, Vincent Price, Voldemort, Wizard of Oz. Love Hugo Weaving’s laugh as Agent Smith. Definitely deserved the top spot. When you think of an evil laugh, I think that’s the one you want to replicate, for sure!